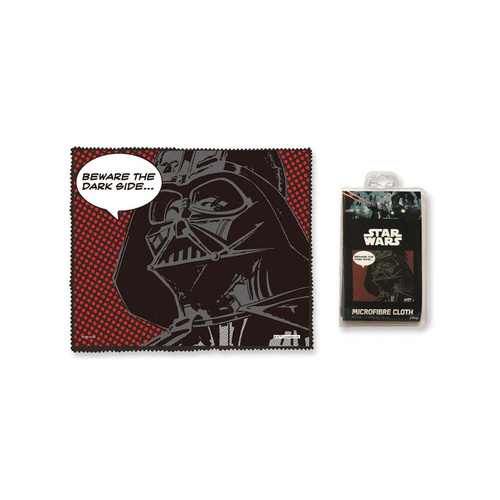 Star Wars Beware the Dark Side Microfibre Cloth | Microfiber cleans glasses without smudges! If you're tired of scratching up your glasses whilst trying to polish them on your shirt, this Star Wars microfibre cloth is just the thing for you. Ideal for polishing laptop screens, smartphones, reading glasses and your entire Star Wars collection, this officially licensed Star Wars cleaning cloth features Darth Vader, along with the wise Jedi words "Beware the Dark Side...". Use The Force to tackle chores around the home, office or car. Microfibre allows you to attract and lift dirt whilst protecting surfaces from scratches and harsh abrasives.